I've long been a big fan of crime fiction, particularly crime fiction that is connected to a city I know. I like how crime writers can act as a kind of travel guide, showing us a city or even neighborhood through the lens of its underbelly: Natsuo Kirino and Miyuke Miyabe in Tokyo, Leonardo Padura in Havana, Jo Nesbo in Oslo, and many others. 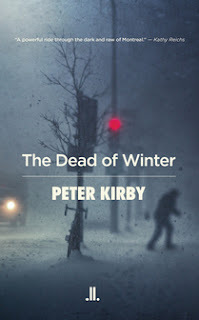 Linda Leith Publishing has recently published Peter Kirby's The Dead of Winter, a fascinating novel, a chronicle of a series of crimes which rock the church and business establishments in the middle of a bleak, dark, and cold Montreal winter. "If you think about it, it turns into words..."